Official US Army Air Force Training Command photograph of 20 Tuskegee Airmen posing in front of a P-40; Tuskegee Army Airfield. 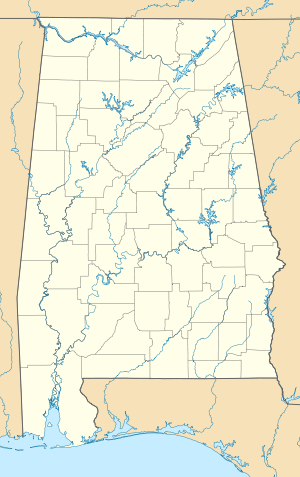 During World War II, the United States Army Air Forces (USAAF) established numerous airfields in Alabama for antisubmarine defense in the Gulf of Mexico and for training pilots and aircrews of AAF fighters and bombers. Most of these airfields were under the command of Third Air Force or the Army Air Forces Training Command (AAFTC) (A predecessor of the current-day United States Air Force Air Education and Training Command). However the other USAAF support commands (Air Technical Service Command (ATSC); Air Transport Command (ATC) or Troop Carrier Command) commanded a significant number of airfields in a support roles. It is still possible to find remnants of these wartime airfields. Many were converted into municipal airports, some were returned to agriculture and several were retained as United States Air Force installations and were front-line bases during the Cold War. Hundreds of the temporary buildings that were used survive today, and are being used for other purposes. Brookley Field, 4 miles (6.4 km) south of Mobile. This page was last edited on 19 October 2018, at 17:08 (UTC).